Cimorene is everything a princess is not supposed to be: headstrong, tomboyish, smart…and bored. 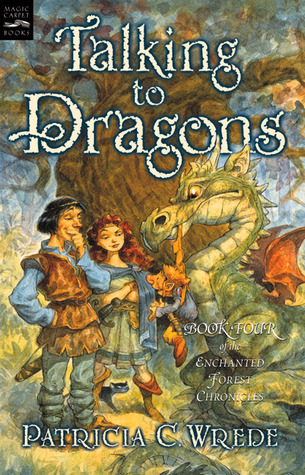 So bored that she runs away to live with a dragon…and finds the family and excitement she’s been looking for. Cimorene, the princess who refuses to be proper, meets her match in the not-quite-kingly Mendanbar. With the aid of a broken-down magic carpet and a leaky magical sword, the two tackle a series of dragon-nappings. Those wicked wizards are back–and they’ve become very smart. (Sort of.) 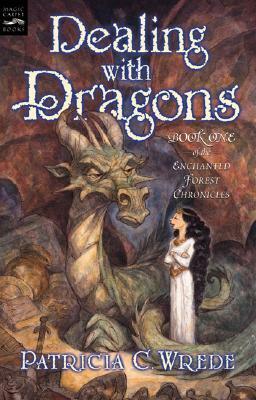 They intend to take over the Enchanted Forest once and for all…unless Cimorene finds a way to stop them. And some people think being queen is easy. One day, Daystar’s mom, Cimorene, hands him a magic sword and kicks him out of the house. Daystar doesn’t know what he is supposed to do with the magic sword, but knowing Cimorene, he’s sure it must involve a dragon or two! The characters in these books are hilarious and awesome. Cimorene is tired of being a princess, so she decides to move in with dragons and fight off her own knights who try to rescue her. As a teen (okay and still today) this was awesome to me, I would have loved to live with dragons and have a hidden dragon treasure room full of old books! Morwen is the no nonsense witch with a house full of cats that only she can understand – except they really talk back to her, not to be confused with people like me who only pretend to have conversations with their cats. Moving on, there are of course, dragons!! Sweet ones, scary ones, allergic ones and some who have rather abrasive attitudes but overall they are big-hearted and highly entertaining. 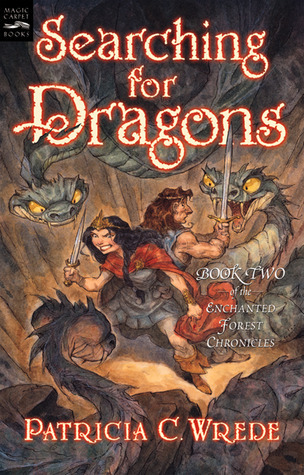 I absolutely loved this series growing up, it was one of the first series I read as a teen and Patricia C. Wrede and Mercedes Lackey are two of the authors who really started my obsession for reading. 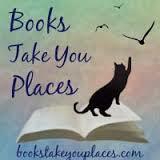 These stories are light and fun and filled with everything a fairy tale needs. Patricia C. Wrede is an author who set the standards high for me as a teen and I still use these books as a basis when I am reading authors new to me with related stories, such as, Dragonswood or Seraphina and it is rare that I fall in love with an author’s work as much as I loved these books.Though these books may seem a little juvenile as an adult reader I still love them. The stories are entertaining and every time I read them I still find myself excited to see what will happen next. I still go back and read these books at least once a year and they still entertain me as they did years ago. I highly recommend them to anyone interested in a not so ordinary princess tale filled with dragons, friendships, strong characters and a few sweet romances. 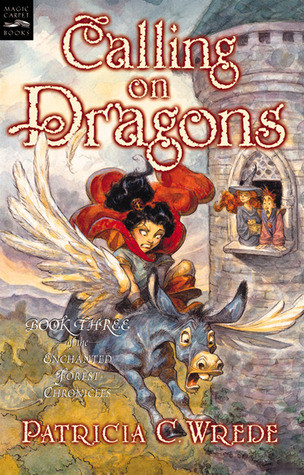 This entry was posted in Middle-Grade, Reviews, Young-Adult and tagged dragons, fairy tales, fantasy, princesses, romance, witches. Bookmark the permalink. Okay so can I admit to you that I'm pretty sure I've never read any of these? I'm 90% certain that Dealing With Dragons is sitting on my bookshelf in my childhood bedroom back home. I swear I own it, but I've always been terrible about reading books I own for some reason…I really want to now, especially if you're putting her in a camp with Mercedes Lackey!